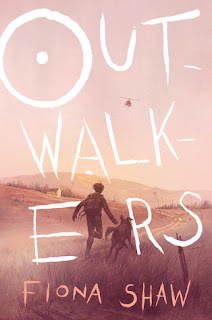 Outwalkers, by Fiona Shaw (David Fickling Books, Middle Grade, Feb 26, 2019), is set in a future England that closed its boarders after the Faith Bombings. To keep people "safe", they are chipped, and warned not to venture into the countryside for fear of the virus that lurks there. When Jake's parents die, he's sent to one of the government homes, which are basically prisons for unclaimed kids. Jake escapes, and returns to his old home, where he's reunited with his beloved dog, Jet. But then he's faced with an impossible journey--escape from England to his grandparents in Scotland, on the other side of a heavily militarized boarder. Fortunately for Jake, he's found by a band of Outwalkers, kids in circumstances similar to his own, who are also trying to head to the free north. The Outwalker kids have been on their own long enough to learn how to survive...but even once they remove their chips, the journey north is fraught with danger. When a security guard accidently dies while trying to catch them in London, the danger gets even more intense. Escaping into an abandoned Underground station, they are safe for the moment, but it is a trap. And when a new girl joins their band, wanted by one of the highest government officials in the country, a safe way north seems even harder to believe in. But they make it in the end, thanks to remarkable luck and a series of helpful grownups appearing like dei ex machina to risk their own lives to get the kids to safety. It's certainly an exciting story, with lots of peril and uncertainty and close shaves. If you like survival stories, you'll find lots to enjoy in that regard; hunger is a constant in these kids' lives (aside--I appreciate that one of the things the kids steal is tampons; nice bit of realism!). If you are looking for strong friendships, you'll find them here too, to a certain extent. The reader is expected to believe in the strong bonds that form amongst the kids as they look out for each other (and I did), but the stress of their journey, and the traumas that each one carries with them, means that there's little time for bonds stemming from sharing and talking. Fiona Shaw's choice to indicate dialogue with beginning dashes, -like this, she said, is jarring, and didn't work well for me, and what will young readers think of it? So my reaction was somewhat mixed, but if you like kids on the run from the evil government, and it is a very evil government, terrifyingly plausible, you might well enjoy it lots! In case you were wondering/worrying-- Jet, Jake's dog, has a role in the story, and (spoiler warning) he doesn't die. Sounds like a really exciting read. Thanks for the review.